Train travel is relaxing and liberating. We already said that before and we keep saying it. Traveling Europe by train is one of the easiest and most interesting ways to discover this interesting continent. Seeing the landscape roll you by and change with every passing hour, the comforting and iconic hobbling of the iron rooster and the casual stops in a remote platform that takes you way back in time. I just love traveling by train. It gives me a carefree feeling and it relaxes me. We traveled through Central and Eastern Europe by train. It was the experience of a lifetime. The sleeper trains, some of which were older than anyone I know, made me imagine the deploying plots that might have played here. We want to share our Central and Eastern Europe Interrail route with you guys. This 2-week Interrail route is a loop, so you can start and end it at any point in the route. You can also expand this 2-week itinerary to a 3 or a 4-week itinerary. Stretch it as much as you want! Some of our posts contain affiliate links. This means if you purchase something through one of these links, we get a small commission on the sale. You will never pay extra for an affiliate product. Thanks for your support! This journey covers a lot of ground in 2 weeks. You actually travel through 6 different countries. For this trip, you need an Interrail Global Pass. If you follow the 2-week itinerary without the extra stops, this itinerary includes 6 travel days. You can include one extra stopover for the exact same price. Check out the 7 days in One Month rail pass. Read more about how to use the Interrail pass in this article. Without further ado, here’s the 2 week Central and Eastern Europe Interrail Route! 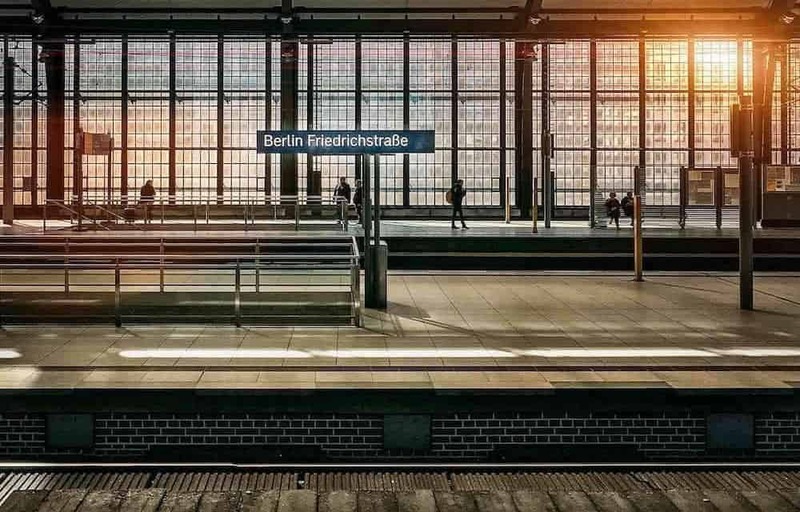 Start your travel through Central Europe by train in Berlin. The capital of Germany is a lively and busy city. There are tons of sights and activities you can do. But there’s also an awesome nightlife for straight travelers, as well as LGBT travelers. 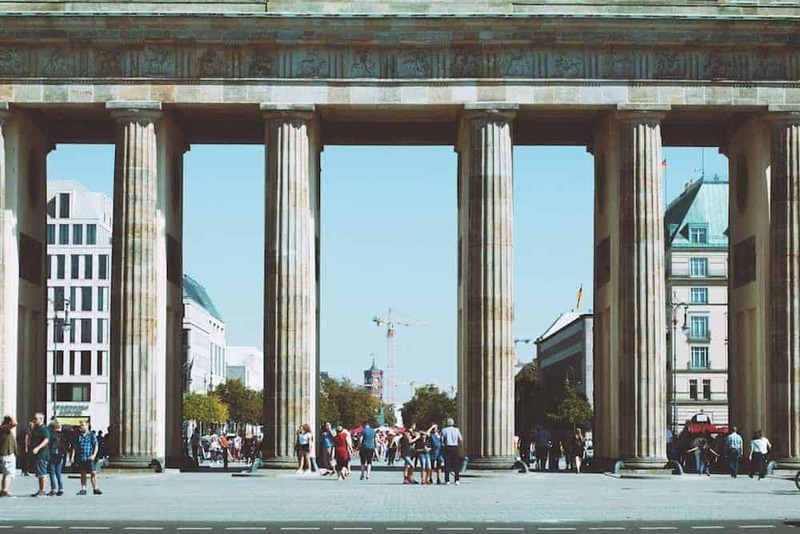 Join a free walking tour in Berlin and visit the classic sightseeing spots, like Brandenburg Gate, the Potsdamer Platz, and the TV tower. In Berlin, you can also join a beer tasting tour or an alternative pub crawl. Berlin is not the cheapest place to spend the night. But there are quite a few cool hotels and hostels! You could choose to book a bed in the budget-friendly Wombat’s City Hostel or The Circus Hostel, both of which are traveler favorites. Hotel Berlin and Vienna House Easy are both part of the Pink Pillow Collection in Berlin. These hotels are very LGBT-friendly. Although the other hotels mentioned in this list also welcome all travelers! Gdansk Old Town is great for walks and souvenir shopping. Join a food tour or learn about the legends of Gdansk. If you feel like going to the beach, we recommend taking a quick ten-minute train to the small town of Sopot, where you can sit on the beach or have a drink. Sopot is also known for the crooked little house in the main shopping street. Read our travel guide to Gdansk to learn more about this interesting city in Poland. A day train takes you to Gdansk, Poland. The train ride from Berlin to Gdansk takes around 7 or 8 hours, depending on the exact train you take. The route between Berlin and Gdansk is cool since it changes dramatically once you pass the Polish border. In Poland, you can see deer and other wildlife running next to the train. If you start your travel day in the morning, you have time left to explore Gdansk and have a nice meal in the evening. Gdansk is a lot more affordable than Berlin. Get a budget-friendly bed in the popular and modern Hostel Filip 2 or in the High 5 Hostel, which is set in an ancient building in the Old Town. Looking for a more private accommodation? Check out the beautiful Elewator Hotel in the heart of the city or the beautiful Stay Inn Hotel. Krakow is a must-visit when in Poland. The city is beautiful and there’s a lot to see inside the city, as well as in the surrounding area. Walk around in the ancient city or take a stroll through the surrounding park. Krakow is also known for its escape rooms… if you dare! From Krakow, the Wieliczka Salt mine or the Oscar Schindler Factory can be visited on a day trip. We recommend going to the Auschwitz – Birkenau Memorial and feel the emotion that still lingers in site. You can visit the memorial in one day. Read more about visiting Auschwitz in this post. The Gdansk to Krakow train takes 5 to 6 hours. Halfway through your trip, the train ride through a tunnel underneath Warsaw. If you have a few extra days, you can easily add Warsaw to your Interrail Itinerary. Krakow is a relatively budget-friendly destination. The One World Hostel and the Intro Hostel are both popular with budget travelers and young folks. Looking for a little more privacy? Check out the Aparthotel Rakowicka or Hotel 32 in the Old Town of Krakow. The mountain town of Zakopane is located in the stunning Tatra mountain range. If you have a few extra days to spend during your Central European holiday then this is the place to add. Escape city life for a few more days and indulge the breathtaking scenery of this cute village in Southern Poland. There is some awesome hiking in the area. If you travel this journey in winter time, you might even get a few skiing days in the middle of your Interrail trip! You can hike to the beautiful Morskie Oko Lake or visit one of the Kasprowy mountain peaks by cable cart. Take a day-trip from Krakow to Zakopane or join a hot springs tour in Zakopane. Zakopane can be reached by train or bus. The train trip takes around 3 hours during which you can see the landscape change from grassy fields and woods into rough mountains and valleys. Check out the Villa Nova hotel if you plan on visiting Zakopane. Take a night train from Krakow to Budapest! The trip from Krakow to Budapest takes longer than you would expect, so a night train is a great solution. This way, you don’t loose daylight traveling and you save a night in a hotel. The IC 407 leaves the main station in Krakow around 22h. Expect to arrive in Budapest around 8h30 in the morning! Budapest is a hip and thriving city in Central Europe. It’s the most popular city in Hungary, as capitals tend to be interesting. And Budapest is no exception to that! Visit one of the beautiful castles in Budapest! And don’t forget to check out our Budapest Sightseeing guide! This interesting city has a lot to offer for every type of traveler! With a lively nightlife and tons of cool, eclectic ruin bars, there is definitely something in it for everyone. Most hotels in Budapest are open for all travelers. Hotel Clark is LGBT-owned, that’s why it’s most definitely a good choice for LGBT travelers. The Iberostar Grand Budapest has a central location in the heart of Budapest. With a perfect location, the Sofitel Budapest Chain Bridge Hotel is also a wonderful accommodation choice in Budapest. Bratislava is the capital of Slovakia and it’s a very interesting stopover. You can either visit Bratislava on a day trip from Budapest or Vienna. But it’s also a great option to spend a few days in the city if you have a little time to spare. The train from Budapest to Bratislava takes 2 to 3 hours, depending on the exact train you choose. There are a few direct connections available and those are definitely your best choice. If you plan on visiting Bratislava, check out the brand new and budget-friendly Boutique Capsule Hostel Chors or the Chill House. Looking for more romantic accommodation? Then check out the LOFT Hotel Bratislava! The capital of Austria has been an inspiration for artists over the last decades. Museums, art galleries, churches, and cathedrals line up for you to visit them and get your inspiration flowing. Don’t forget to get a Vienna City Card in order to get free access to tons of activities and sights in Vienna. Vienna is an LGBT-friendly destination and they even have some parties and activities for women only. Check if upcoming lesbian Pinked parties collide with your travel dates. In 2019, Vienna is the host for the Europride! So that’s a great opportunity to plan your travel dates according to the Pride dates in 2019. This short travel day from Budapest to Vienna only requires 1 hour of direct high-speed train travel before arriving in the stunning setting of Vienna. Have you decided to add Bratislava to your itinerary? The Bratislava to Vienna train takes you to your destination in 1 hour. As for finding romantic accommodation for traveling couples, we suggest staying at the Radisson BLU Style Hotel in the center of Vienna or the NH Wien City. When visiting Vienna, we stayed in the Kunsthaus Apartments Vienna, which has regular promotions in order to make your stay affordable. Want to save your budget for other stuff? Check out the Wombat’s City Hostel. Prague is in the middle between Berlin, Vienna, and Munich. 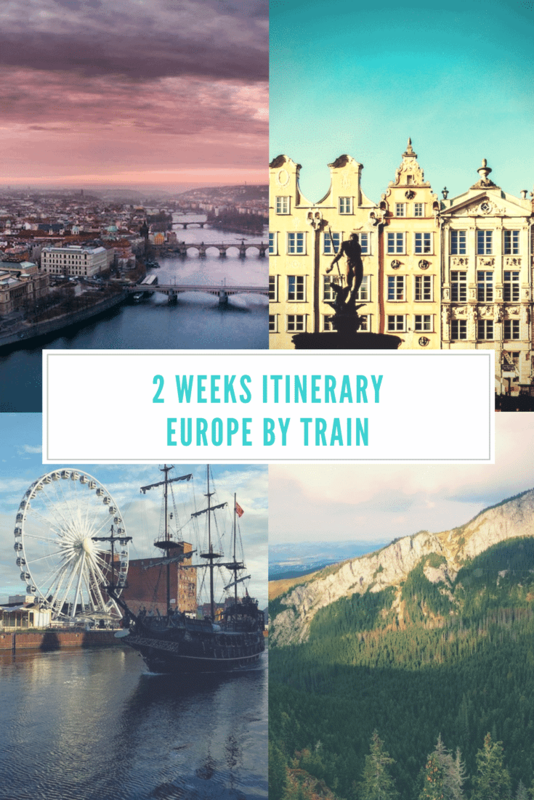 On top of that, it’s a great city trip in Europe and you can easily include it into your awesome 2-week Interrail itinerary for Europe. In the city of Prague, you can do tons of cool activities. For instance, enjoy a medieval dinner with unlimited drinks in an authentic atmosphere or do a sightseeing cruise on the Vltava river. Prague is a lesbian-friendly destination and on weekend, you can visit the women-only Jampa Dampa bar or see if the Freedom parties line up with your travel dates. You can also attend Pride in Prague! Check the Pride calendar for Europe! The Vienna to Prague train ride takes around 4 hours with a direct train line. For budget accommodation, we recommend Hostel One Home and McSleep Hostel. If you’re looking for something a little more romantic, the Vienna House Andel’s and Angelo by Vienna House are great hotel options. Back to Berlin! This is where we started out but you can also mix up this itinerary or start anywhere in the circle. Take a few extra days to relax or add extra destinations into your route if you have more time or if you like to travel faster. The direct train from Prague to Berlin takes around 4 hours. Make sure to select a direct train, because some trips take much longer. This is just an example itinerary for a two week trip to Central Europe. But really anything is possible! Are you more into city trips, nature trips or do you want to party in each city? Any destination itinerary can be crafted to best fit your wishes and budget. Keep an eye on our website to see more itineraries pop up in the future. If you have any LGBT themed questions or itinerary ideas, don’t hesitate to get in touch with us. Check out these posts too! Get monthly blog updates and inside tips straight into your inbox! My name is Inge. I'm a traveler, writer and photographer. All those things I want to share with you. I've traveled a lot and wish to explore some more unknown territory. How fun! 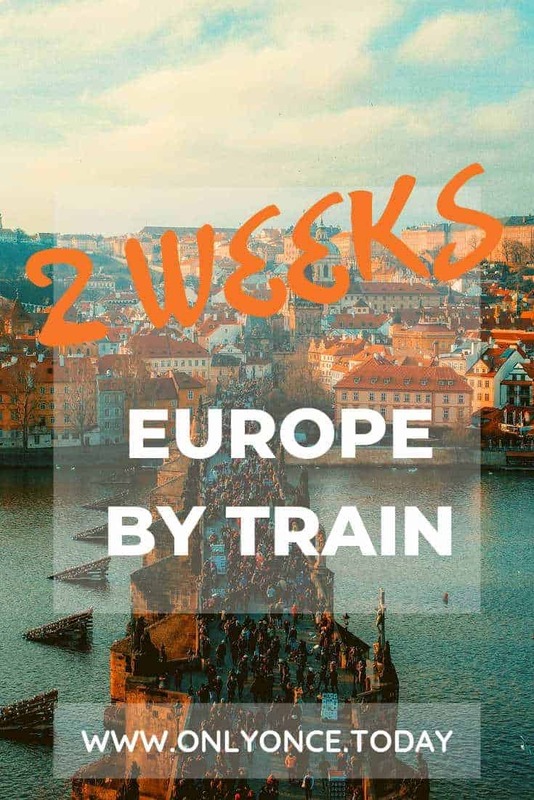 Interrail is a great way to quickly see Europe, while hitting all of the main points and taking in the culture of several countries! Get a monthly update and insider tips straight into your inbox.